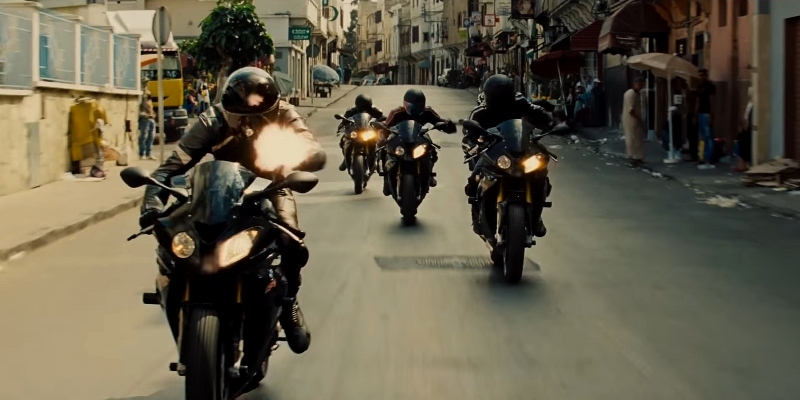 Not every installment of the Mission: Impossible film series has been great...but for sheer action and entertainment, it's remained a reliable franchise for almost 20 years now. Sequels have arrived every few years like clockwork since the original 1996 film, with a revolving door of directors, producers, and cast members offering unique contributions with varying degrees of success. Most will agree that John Woo's Mission: Impossible II is the franchise's low point...but without spiraling into a wordy rant comparing and contrasting each of the five M:I movies, I'll just flatly profess that my favorite to date has been 2011's Ghost Protocol. That's quite a feat, when you think about it: I can't say that about any other fourth film in a franchise, but that's just a testament to its staying power and the commitment of Tom Cruise...who, aside from Ving Rhames, is the only one who's been involved in all five. 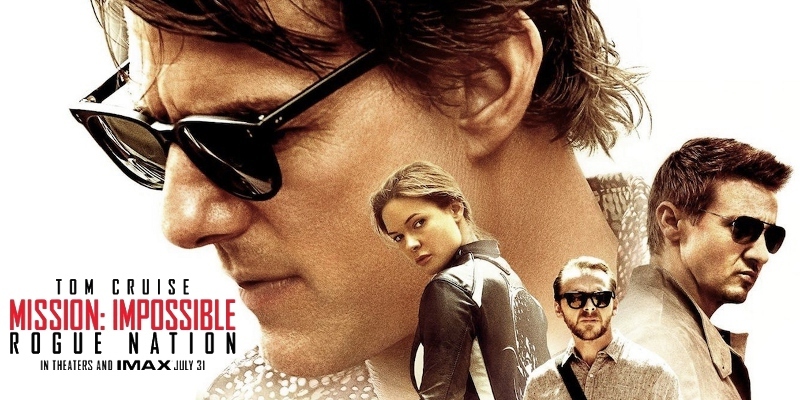 Cruise once again portrays Ethan Hunt, the unkillable IMF agent perpetually followed by international intrigue, cool gadgets, and seemingly insurmountable odds. Returning to his side are good guys Luther Stickell (Rhames), Benjamin "Benji" Dunn (Simon Pegg), and William Brandt (Jeremy Renner), forming a tightly-knit team that's somewhat new for the franchise; up until JJ Abrams' kinda-decent Mission: Impossible III, the series never bothered with familiar faces. Either way, they're squared off against no shortage of new opposition: the dastardly Solomon Lane (Sean Harris) emerges as leader of a international group known as "The Syndicate", while Janik "The Bone Doctor" Vinter (Jens Hulten) is as imposing as his name suggests. Even on the home front, Ethan and company are threatened by CIA Director Alan Hunley (Alec Baldwin), who wants to shut down the IMF and Hunt's reckless methods. Caught in the middle is Ilsa Faust (Rebecca Ferguson), whose loyalty is unpredictable but just might be the key to IMF's resurrection. But none of that matters quite as much this time around. Most people just want to see Tom Cruise hang off the side of a plane, just like Ghost Protocol sold countless tickets just from the image of Cruise scaling the Burj Dubai. There's nothing inherently wrong with that, of course: many successful action franchises can't help but one-up the previous installment, and the absolute commitment of Cruise (who performed the stunt eight times during production) means that future missions may only get bigger, higher, and faster. But where do you go when such a crowd-pleasing stunt arrives and ends before the opening credits? Well, there are other memorable moments along the way, none more so than a high-speed motorcycle chase (performed at real speeds, with more digital "traffic" added later) and a tense underwater sequence that required Cruise to hold his breath for several minutes at a time. But, unlike Ghost Protocol, the surrounding story doesn't feel as engaging or important as those jaw-dropping action sequences: whenever there's a break in the action, it's usually for plot exposition or footage of Alec Baldwin looking grumpy. Still, Rogue Nation is a fun ride while it lasts, with all the familiar hallmarks of a Mission: Impossible movie in full effect along the way. Cool toys? Check. Complicated heist sequence? Check. Tom Cruise running as only he can? Check. It's directed by writer Christopher McQuarrie, who previously collaborated with Cruise on a handful of films including the recent Edge of Tomorrow and Jack Reacher: Rogue Nation is both a worthy installment in the M:I franchise and another notch in what might be a long working relationship between the writer/director and star. A sixth installment is already in the works with McQuarrie slated to direct, which might very well mean that the earlier "revolving door" tradition is finally closing. For now, Rogue Nation plays great on Blu-ray courtesy of Paramount, sporting a pitch-perfect A/V presentation and a somewhat thin but entertaining collection of bonus features. 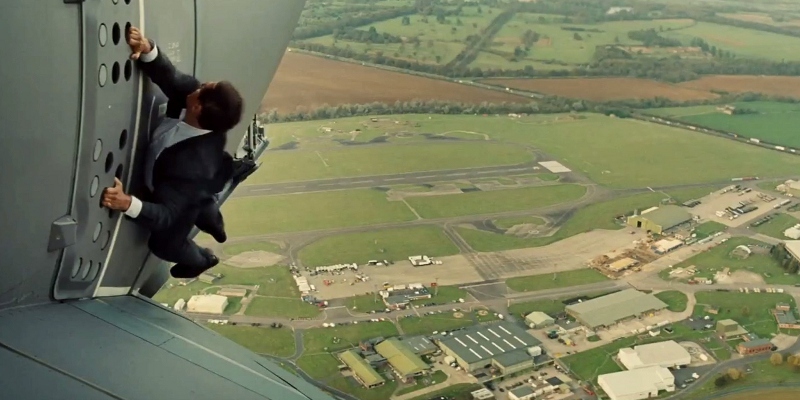 Presented in its original 2.40:1 aspect ratio, Rogue Nation looks as perfect as expected for a recent film ported to Blu-ray. The stylized color palette holds up very nicely (even if it favors the dreaded teal/orange push used in just about everything these days), image detail and textures are top-notch, and nearly all of the film's CGI effects blend in fairly well with the live-action footage. No obvious digital imperfections---including edge enhancement, excessive DNR, banding, compression artifacts, etc.---could be spotted along the way, ensuring that we get a visual presentation similar or equal to most theatrical showings. Paramount's strong track record doesn't hurt, either. NOTE: The stills and captures used on this page are sourced from promotional outlets and do not represent the title under review. The TrueHD 7.1 audio track (which actually defaults to a Dolby Atmos mix if you're equipped for the new format, unlike me) adds more than enough weight to give Rogue Nation a formidable presence from start to finish. Surround activity is very frequent with crisp separation, plenty of LFE punch, strong dynamic range, and crystal-clear dialogue that's balanced well for smaller home theater setups. There's obviously a lot going on during the film and this Blu-ray will most certainly keep your ears fully entertained. Overall, I'm enjoying this trend of Paramount serving up Atmos mixes on their recent releases and hope it continues. French, Spanish, and Portuguese dubs (Dolby Digital 5.1) are also included during the film, as well as English, SDH, French, Spanish, and Portuguese subtitles. Navigation is smooth and simple with options for chapter selection, extras, and audio/subtitle setup, as well as a handy "Bookmark" interface. This two-disc set arrives in a dual-hubbed keepcase with matching slipcover; separate Digital Copy codes (for Rogue Nation, as well as your choice of the other four M:I films) are also inside. Not too much...and I've got a sinking feeling that, like Ghost Protocol, it's another victim of "retailer exclusive extras". Still, there's some entertaining and informative stuff here, the best of which is a feature-length Audio Commentary with Tom Cruise and director Christopher McQuarrie. These two are obviously comfortable with one another; Rogue Nation is their fourth collaboration, and McQuarrie will most likely return for the next M:I installment. As such, it's a laid-back and enjoyable track filled with production details, personal stories, trivia tidbits, and a few laughs. The rest is a collection of vaguely promotional Featurettes similar to those found on past M:I releases. These are mostly self-explanatory and include "Lighting the Fuse" (5:57), "Cruise Control" (6:33), "Heroes" (8:05), "Cruising Altitude" (AKA "the plane stunt", 8:23), "Mission: Immersible" (training for the underwater sequence, 6:44), "Sand Theft Auto" (5:35), and "The Missions Continue" (7:06); key participants include Cruise, McQuarrie, Simon Pegg, Jeremy Renner, Rebecca Ferguson, Sean Harris, and more. Optional SDH subtitles are included for all the featurettes. Tom Cruise's ambitious relaunch of the Misson: Impossible franchise is almost two decades deep and, quite surprisingly, it's gotten a second wind in recent years thanks to his insane commitment to the film series' physical demands. Still, it inches ever-closer into caricature territory with Rogue Nation, which feels more like "action first, story second" than the superior Ghost Protocol and has a little trouble flowing smoothly as the mystery deepens. Hopefully the forthcoming follow-up---which will most likely bring back director Christopher McQuarrie, breaking tradition---can dial things back a little bit, or Cruise might just end up space jumping from a shuttle in low Earth orbit. Either way, Rogue Nation is still an engrossing time at the movies and Paramount's Blu-ray offers a fitting amount of support, including a top-tier A/V presentation and a handful of entertaining bonus features. Firmly Recommended.